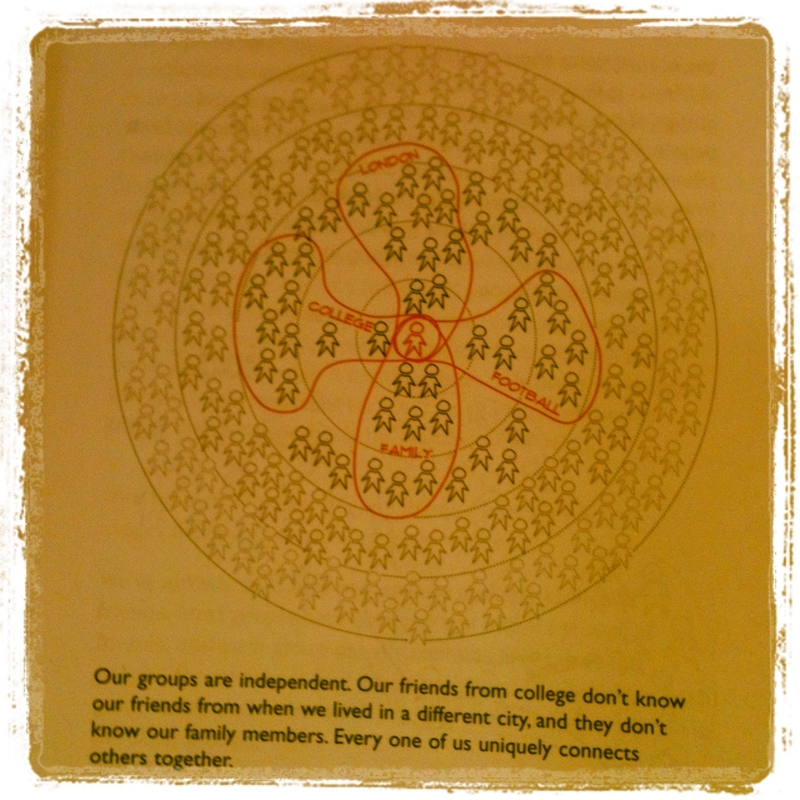 I’m reading a book called Grouped. As a result I’ve decided that the future of planning is Wedding Planning. We should all become Wedding Planners from here on in. I don’t mean we should create huge events. I don’t suggest we make people spend loads of money. And I certainly don’t mean we enter a whole new line of business. When you get married you want to celebrate with everyone you know. You draw up a list of who’s important to you, then invite them to a celebration all about you and your partner. You probably generate a long list first. And you probably do this by thinking through the different relationships you have, then working out whether they deserve a spot beside you at “the most important day of your life”. TM. You have your family, your school friends, the mates from university and work, then some other people you’ve collected along the way. Then you think about a table plan. Who sits next to who. These can feel like huge decisions, but it’s often surprising how easily the list you made can be segmented into appropriate table groups. And, weirdly, how 8-10 people per table feels representative of your life. At this point you realise that you’ve formed a bunch of different groups from the various phases and moments of your life. And none of them know each other. Now, these groups don’t exist because you’re organising a wedding. But weddings are pretty much the only day in your life that all these groups are in the same place at once. This is why you feel so special. They are your audience for the day. You’ve created something for them to share in. You sent them an invitation to join in something that was important to you and they came. We do this all the time, of course. We rarely do it at such scale or with such intensity as we do when we get married, but maintaining ties and connections with those separate groups is important to us throughout our lives – so our life is spent sending and receiving invitations, sharing thoughts, connecting with people we like in an effort to maintain a sense of belonging. Ideas and communication flows back and forth between us and the networks we belong to. We share different interests with different networks, and different relationships with different people within those networks. Our ties may be stronger or weaker, our communications with them may be more or less frequent. But the different networks remain important to us. The groups we belong to form part of our identity. It’s just that those groups are compartmentalised most of the time. This image from Grouped is the one I think is the one that sums it up. Now, if you’re not married yet, you have all the wedding stuff to come – but I’m willing to bet the idea of separate networks resonates with you. If you are married, then you’ll remember that writing the invitation list really brings it home. And if it did, it can be quite disarming when you realise the list you’d make now might be different to the one you made then. Because networks change over time, too. Does what I’ve described here sound unrepresentative or uncommon? Am I describing ‘influential’ people, or just people? Is this characteristic of ‘early adopters’ or just part of everyone’s social experience? I’m pretty convinced that most of us are at the centre of a number of networks in this way. Knowing this, wouldn’t we want to move away from the assumption that there are a small number of hubs/mavens/influentials/whatever who could drive advocacy simply because we reached them first? Wouldn’t we want to start creating campaigns, content and experiences for people that reflect everyone’s position at the centre of their own range of networks? Wouldn’t we want to treat them the way they always feel but rarely get to actually experience – at the centre of their own world? We won’t, nor should we, always want to build things that are relevant to all networks. By definition this is not how people really live – they compartmentalise. It’s only really a few moments in life (like weddings, for instance) where this is remotely relevant. But weddings give us another clue as to how to behave. As my Mum said to me when I was getting married myself, the wedding format is pretty universal – it’s the small tweaks, the customisation, that makes it personal. The music, the food, the setting, etc. And when we’re deciding on those tweaks we will have an audience in mind – whether consciously or unconsciously. An audience made up of people from our networks. The tweaks are part of the story we want to tell about ourselves. So what if we thought of those individuals each as a potential bride or groom, at the centre of a set of compartmentalised groups? And what if we were to think not about audiences but about individuals who want to belong? And what if we thought of these individuals, not our clients, as the people for whom we really need to craft the little customised things that can help them tell a story about themselves? You know, like wedding planners.